Who else has been Christmas cooking? There’s been a lot of fudge in my life lately. For someone who had never made fudge before, the whizzy machine has made it a little too easy. I’m having to get it into cellophane bags as quickly as possible to minimise fudge ‘sampling’. I’ve been using Thermoblitz recipe for festive fudge but have been experimenting with it as I found the instructions a little ambiguous, although the results were delicious. I’ve tried different types of sugar, different quantities and different flavours, and I also prefer to blitz the chocolate first. I’ve re-written my version of the basic recipe below, more or less, for you to try your own fudge experiments. The original recipe called for a cup of sugar (about 230gm), but then mentioned 80gm of rapadura sugar, which I don’t have. The first time I made it I used the full cup, then second time I reduced it to 100gm of sugar. The results were very different. The fudge on the left, let’s call it ‘Exhibit A’ had the full cup of golden/raw sugar. Exhibit B, on the right, only had 100gm in it. Fudge A had a richer colour (nb both fudges were a darker colour than this photo shows), was smoother when cut and was obviously sweeter. Delicious but I could only eat a couple of pieces. Fudge B was paler by comparison, had a rougher surface when cut, was equally smooth in the mouth and the flavour was far superior! So fudge B wasn’t quite as pretty but tasted better. Break chocolate into squares (if using a block), and add to cooking bowl. Whizz 5 seconds, sp 10 to turn it into crumbs. Set aside (!) – leaving it in with the other ingredients whilst cooking will result in caramels, not fudge. Equally delicious! Add condensed milk, butter, sugar and glucose. Cook 8 mins, 100⁰ C, speed 3. Cook again 20 mins, varoma temp, Speed 3. While fudge is cooking prepare your tin. I use a 20cm square brownie tin lined with baking/parchment paper. Do this now as you need to decant the fudge as soon as it is ready. Add chopped chocolate to cooking bowl. Whizz at Speed 3-4 until all chocolate has melted through. Pour immediately into the prepared tin and allow to set at room temperature. Tip: With 230gm of sugar the fudge remained pouring consistency and took longer to set. With 100gm sugar it almost set immediately after adding the chocolate in the cooking bowl so be prepared to work quickly! I ended up placing a piece of baking paper on the surface and running my hand over it to get a smooth finish on the top. Add a handful of pistachios and dried cranberries with the white chocolate at Step 5. Sprinkle a few more of each on to the surface of the fudge in the tin, pressing them in slightly. For this version I quickly made some candied orange slices before I started. I substituted the white chocolate for dark chocolate, substituted regular sugar for brown sugar, and substituted the resulting left over syrup from the oranges for the glucose syrup. After pouring it into the tin I placed the orange pieces on the surface. It was tasty, although crumblier, but I highly recommend chopping the orange into much much smaller pieces as it was almost impossible to cut! I had to tip it upside down onto a board so that the orange was on the bottom while slicing. Also, using the dark chocolate it wanted to split so it might be more successful using milk chocolate or allowing the fudge mix to cool a little before stirring through the chocolate. This entry was posted in Recipes, Treats & Snacks and tagged chocolate, festive, fudge, gifts, gluten free, grain free, recipe, Thermomix, white chocolate. Bookmark the permalink. Sounds Great Kirrin. As Mentioned on my recipe I am allergic to rapadura. That I found out since making the recipe originally so now I don’t have it at all. Personally it is all about personal preference. For me the least amount of sugar I can use the better. I hope that helps clarify ? I haven’t tried rapadura yet, but I do quite like coconut sugar. How unfortunate to be allergic to it! 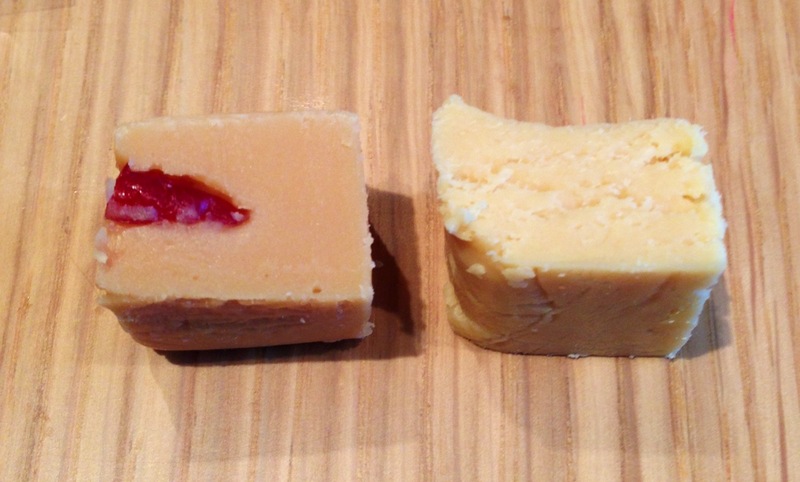 Your festive fudge is a big hit in the UK thermo-world at the moment. Buckets of it being cooked all over the place. Thanks for sharing it. Can I use coconut sugar instead of this raw sugar? I haven’t tried it but I think it would work just fine. I did use brown sugar in the dark chocolate version. It would also be nice to try it with the Quirky Cooking coconut condensed milk (that does exist doesn’t it? I didn’t just dream it?). Coconut sugar takes more time to blend than normal sugar, its texture is coarse, but it enhances the flavor and people fond of the coconut flavor, enjoy it to the fullest, that is what my learning says. I should clarify. I haven’t tried coconut sugar in fudge, but I have used it in many other things and I really like it. The fudge cooks for 30 mins in total so I think it would have time to dissolve. Hi, this recipe looks great but I am hesitant to use glucose. Is there something else I can replace this with? Thank you! Oops, I missed this question ages ago…. Sorry. I’m not sure what you could replace the glucose with. You could just leave it out but the fudge will not be as smooth. The glucose helps to make it creamy. Curious as to why you don’t want to use glucose though? It is just a type of sugar syrup and the recipe is chock full of sugar already. Hi Tammy, I haven’t tried doubling the recipe but I personally wouldn’t do it. Apart from the very real risk of personally consuming twice as much fudge, this recipe cooks at a very high heat. Increasing the volume increases the risk of it bubbling out (much like pictures I’ve seen when people double jam recipes) and I’d hate to see anyone get burned! If you want to cook double, perhaps try milling enough chocolate for the two batches up front and set it aside. Proceed with a single batch and weigh back in the correct amount of chocolate. Tip into your tin and repeat. This way you shouldn’t need to clean the bowl in between or risk a hot bowl melting the chocolate you’re trying to chop.